You are here: Home / 2. Cargo Control / Sometimes you just need to take two trips! Sometimes you just need to take two trips! Listen up… we all want it done now. We are tired. We want to get home. We want to finish the job. 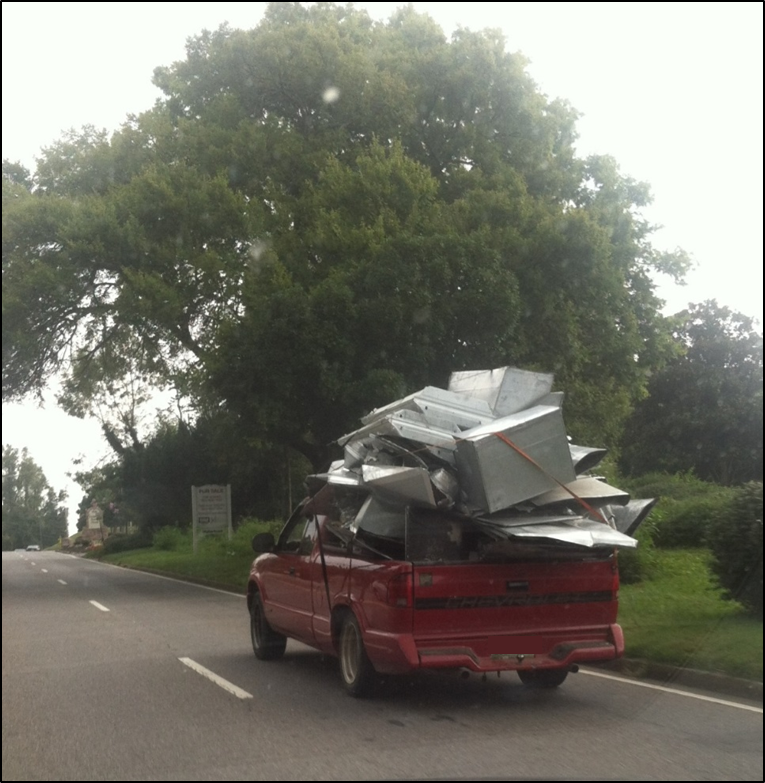 Not even the Bednet® Original Cargo Restraint System would restrain this load safely. Don’t stack loose objects above the bed rails. Try to get everything on the floor of the pickup. Solid objects or leafy brush may safely be stacked higher if you tie it down well. But don’t ever stack anything higher than the top of the cab. Try not to use bungee cords, they are dangerous and a leading cause of eye injury. Most bungee cords are too short to be stretched completely across the truck, and you might damage the load by hooking into it. Cam and ratchet straps can be safely employed, but use the factory anchor points when possible instead of the fender. You probably need more straps than you think, especially for heavy or multiple objects. Always run them across the bed and on the diagonal. Make sure every object has active containment. Learn how to tie a Truckers Hitch, it’s easy to do and allows you to put active pressure on the load so it doesn’t bounce around. When a load bounces and shifts, the rope or straps work themselves in between or off the load entirely. This gives you a loose load. Once tightened, you should be able to rock the truck by rocking the load with your hand. 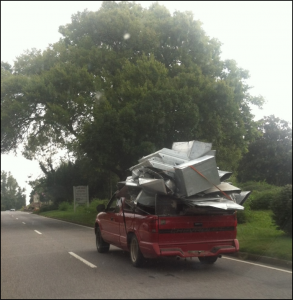 Your truck should be one with its load. And finally, if you are not positive the load is secure, take two trips!